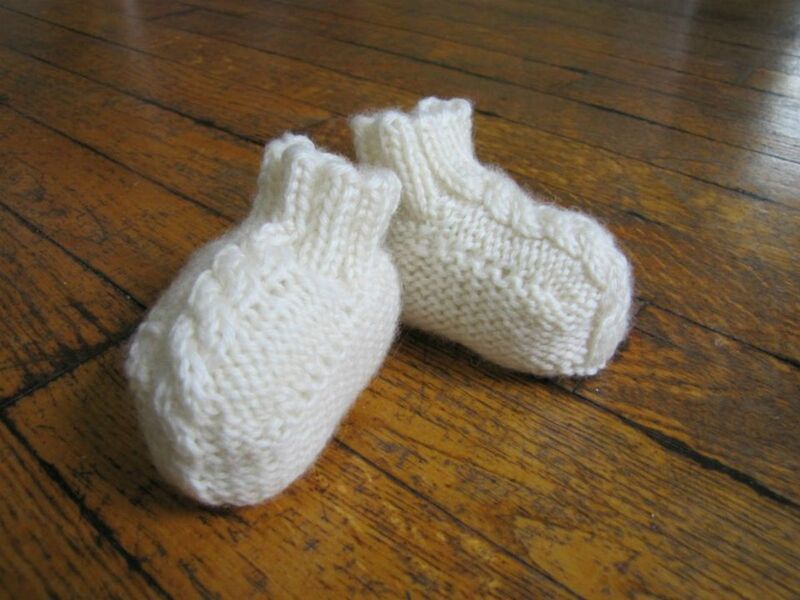 These booties match the Baby Aran Body Suit and Baby Aran Hat as part of the Baby Aran layette set. Sized for younger babies, they are also perfect on their own as a baby shower gift. Sample knit in 3-6 month size, by Eileen Casey. Cast on 26 (30) stitches and work in 2x2 rib as follows: K1, *K2, P2. Repeat from * to last stitch, K1. Continue until ribbing measures 1.25 inches. On last row of ribbing, make one after 10 stitches, and again 10 stitches before the end. 28 (32) stitches. Next row: P12 (14), commence Rope Cable 1 chart starting at Row 1, P12 (14). Next row: K12 (14), P4, K12 (14). Place first 9 (10) stitches on a holder, P3 (4), work 4 stitches of Rope Cable 1 chart, P3 (4), turn. Work these 10 (12) stitches back and forth in rows, working the cable chart as established, for 12 (14) rows. Break yarn. Place stitches on the holder back on the needle. Work these 9 (10) stitches, pick up and knit 5 (7) stitches along side of instep, work 10 (12) instep stitches, pick up and knit 5 (7) stitches down other side of instep, work last 9 (10) stitches. 38 (46) stitches. Work in Reverse Stockinette Stitch for 7 (9) rows, maintaining the cable chart as set. K2, k2tog, K9 (13), k2tog, K4, k2tog, K9 (13), k2tog, K2. 30 (38) stitches. K2, k2tog, K7 (11), k2tog, K4, k2tog, K7 (11), k2tog, K2. 26 (34) stitches. The next 2 rows are for the larger size only. K2, k2tog, K9, k2tog, K4, k2tog, K9, k2tog, K2. (30) stitches. All sizes: Bind off all stitches. Sew seam along back and sole of bootie. Weave in ends. Block, stuffing the booties with batting or fiber fill while they dry to give them shape. Make second bootie, substituting Rope Cable 2 chart.